Three years ago, I was leading a blissfully happy life. It had been a great year: work was going well, my personal life was fabulous. I'd been on a couple great vacations---I spent a week in luxury hotels and spas in Arizona; spent a few days relaxing in the mountains of PA; went to Key West for a long weekend. I was going to the gym almost every weekday, and getting healthy. I was looking forward to actually going away for the first time ever for Christmas, I was going to spend it in Key West with my best friend. Then in January, a group of us were planning an Jamaican vacation. I was driving an '04 Jeep Liberty, it was less than a year old. I loved that little truck! For relaxation, I gardened extensively in the spring and summer, enjoyed going to the beach in the summer, I loved the ocean. Living 1/2 mile from the beach has it's merits. In the fall and winter, I'd walk the beach and collect seaglass. Yes, to me, I was living a very good life. Three years ago, I had spent the weekend at my friends' house in PA, and left for home about 10:30 pm on Sunday night. Little did I know, but a bit more than an hour later, at 1/4 to midnight, my life as I knew it would change forever. It would be a very long road home. Because, at that time, a delivery truck crossed the median on Rt 287 and smashed head on into my vehicle. I know my route home, I made that trip often. I was traveling in the center lane, and going no more than 65mph. But, I don't remember anything about the accident. I have vague recollection of EMTs and Firemen, and begging them to get me out, from what I didn't know...being wheeled into a hospital asking what happened? over and over. This...this is what happened. This is what happened when a 3 ton box truck smashed into me. The witness said, upon impact, my Liberty rolled, the truck rolled over me , he didn't think I was alive when he saw it happen. They had to pull the truck off of my vehicle with a fire truck, and cut me out with the jaws of life. It is a miracle, indeed, that I am here today to write about this. I nearly died that night. I know, it wasn't my time. You see, this date...Dec 12, is my mother's birthday. She was my guardian angel, and kept me safe. I was critical, and was sent to a trauma hospital. Most of my injuries were my lower body, especially my right ankle and knee. They were destroyed. I'd broken my left arm and collar bone and a couple ribs. I had a collapsed lung. I'd lost a lot of blood...I had a number of surgeries. I guess morphine is to be thanked, I really had no pain. After 10 days, I was sent to a sub-acute rehab (in reality a nursing home) to learn how to walk again, hop, really, when I had to, got around in a wheelchair mostly, because I wasn't allowed to put weight on the right. 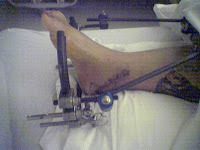 It was immobilized by that crazy contraption. It sure scared some of those oldsters in the home! Especially the huge scars on my legs. I was waiting for a talus bone transplant, which would allow me some mobility in my ankle if that was done. A donor bone became available a month later; I was transported to Baltimore for the surgery. Then, back to rehab, and finally...finally home in March. To learn to adjust to a knew way of living. Getting around was not easy, but every day, a little better. So...here I am today...3 years later. Now, it's hard to remember the "before" because the present is so much more...evident? Does that make sense? I'm having a hard time this year, with this 'anniversary' of sorts, more so than the last two. I don't know why, but I am. Maybe because the reality has set in..."this" is what I get, "this" is only what I can do. I know dwelling on what I can't do any longer won't bring it back...so I must focus on what I can do, not "only" what I can do. I can't garden like I used to. I can't swim in the ocean, walk on the beach and collect seaglass. But...I can knit. And maybe...just maybe, from that, I will find peace. Nancy, you are a strong woman. Stronger than you give yourself credit for. To get through 3 years of such a life changing situation is hard stuff. But you've done it. What's another 3 years? And then 6 after that? Look at the people this has brought into your life. Think about the experiences you've been aforded and how you've grown as a person. Think of the strengths you've carried with you through this. Strenghts you may not have even known you had before this. You are not the same woman you once were, but who among us remains the same over time? Change is reality. We can fight it or embrace it, but it'll happen none the less. You're story is inspiring and I'm glad you are sharing it. My dear friend... I'm so glad you're a survivor and you're here for us to get to know. You give me strength, and I think you know how much I appreciate your EMPATHY and your chin-up, soldier on example. On different, yet similar enough paths, we've found a new hobby, new friends, and for me, a renewed appreciation for what I do still have, and can still do. You're wise to celebrate today, not just as your dear mother's birthday. Yes, life as you knew it changed, but it didn't break you; you were strong enough to bend. I'm amazed that you aren't bitter; your change was a result of someone else's carelessness, not simply a failure of your own body. Dig in and hold onto that peace. I wish you a LONG, healthy lifetime of peace, love and hope. Oh my...Thank God for your Guardian Angel, I'm amazed by just looking at the pictures you survived such a horrific accident. you are definitely one lucky Lady! Thank God for our Guardian Angels! You defintely are a stronger woman like said before! You have lots of strengths that brought you through all this, some I'm sure your not even aware you have. Your celebrating this new life, new beginings will only get better! "Life is what you make of it" I've always been told and I believe you've made a good new life for all you've gone through!! You still have lots more to go too!! New hobby (knitting), more new friends, most importantly a new outlook on life..I believe you were given a second chance, so embrace it, but also go for it too!! Thank you for sharing this as it is inspiring to others. May this New Year bring you even more peace! Indeed, Happy anniversary. Your Mother was defintiely watching over you that day. thank you for sharing your story with us, it was very moving. I too have limited mobility and am thankful everyday for my knitting, I hope it brings you comfort and Joy and God Bless your Mother--guardian angel that she is for you!!! Nancy, you are an one amazing woman and I am so thankful to call you a friend. I'm so happy that knitting has given you a place to share your story and make so many friends that care about you. Your mother was watching you that day and we can all be truly thankful for that. May this new year bring you new adventures, wonderful memories and many blessings. You deserve all this and more!!! Oh, you dear sweet woman. I'm crying for you and all that you've lost - but also in love for what you are now and have become. You are so strong to share this with us - and such an amazing woman. You will find peace - but don't beat yourself up for feeling some discontent at all that you have lost, or things you can't do anymore; it's perfectly acceptable to feel that anger and loss, even three years or thirty years later. You can find peace though; I know you can because even just knowing you this way, I know you are strong, and caring, and loved and inspiring. I wish I could hug you, but know I am in my heart. Wow. After seeing those pictures, it is amazing that you are alive. You are a living, breathing miracle. Never forget that. wow... i can't even begin to imagine what you've been through. thank you for sharing this with us. i'm sure that it must be difficult. I think you have my email, but it is nhknittingmama@comcast.net if you ever want to chat. I dont know why this year would be worse...but it is kinda like after my mom died. The first several years her birthday didnt bother me...but about 3 - 5 years after she died, I got very depressed around her birthday. I think it takes that much time to get thru the grieving process and then you can truly grieve again. Before that it is a lot of shock and dealing with the things you need to deal with...and trust me, after an accident such as you had, you did have to go thru a grieving process too.